The Highlands Ladybirds volleyball team picked up a big victory in Alexandria on Thursday. Highlands knocked off the Bishop Brossart Lady Mustangs, 3-2 (21-25, 25-13, 19-25, 25-20, 16-14). Highlands won its second straight to move to 4-5 overall and Bishop Brossart lost for the first time this season dropping to 9-1. The Lady Mustangs finished 24-13 last year and made it to the 10th Region semifinals. Sophomore Jessica Ginter led Highlands with 17 kills and setter Kaitlin Hall had 44 assists and five aces. Teammate Katie Van Curen added 14 digs. Highlands plays in the Varsity September Slam all day Saturday at Scott High. The Ladybirds open the day with a 10 a.m. contest against Simon Kenton (13-2). Highlands also faces host Scott at Noon, 2011 state runner-up Greenwood (outside Bowling Green) at 2 p.m. and Covington Holmes at 3 p.m. The Bluebirds could not follow up Tuesday's big win over Boone County with a bigger win. Highlands tied the Dixie Heights Colonels, 1-1. Emerson Holladay scored the Bluebird goal in the first half to give Highlands a 1-0 halftime lead. But the Colonels (2-4-1) tied the game with about 18 minutes left in the game from about 35-40 yards out. Nick Breslin had another good game in goal for the Bluebirds (4-2-1 overall) Thursday. He recorded seven saves. Highlands takes on Scott (3-5) at 8 p.m. Saturday. The Newport Central Catholic Lady Breds soccer team too down visiting Villa Madonna, 5-0 on Thursday. NewCath moved to 5-1 playing its third game in three days. The Lady Breds lost on penalty kicks to Bishop Brossart in the All "Ä" Region 9/10 Semifinals on Wednesday. Villa Madonna fell to 1-5. Michela Ware scored two goals to lead NewCath with Sam Bunzel, Loren Zimmerman and Christina Seibert scoring one a piece. Courtney Hagedorn had two assists with Nikki Buller adding the other. Lady Bred goalkeeper Erin Ackerson had to record just one save. This marked the third shutout of the year for NewCath. The Lady Breds do not play again until Wednesday. They play host to Beechwood at 6 p.m. The Campbell County Lady Camels came to Newport on Thursday and beat the Newport Central Catholic Lady Breds, 3-0 (27-25, 25-22, 27-25). NewCath fell to 4-8 and Campbell County improved to 6-7 under the guidance of first-year head coach Kimberlee Nemcek, who was a senior at Northern Kentucky University last year. Nikki Kiernan and Abbie Lukens led NewCath with seven kills each. Teammate Alyssa Maier had 23 assists and Maria Froendhoff had 19 digs. The Lady Breds do not play again until Thursday at 6 p.m. at home against Boone County. Players may handle the recruiting process in different fashions. But many make verbal commitments to play at the college level long before their senior seasons begin so they can focus on their sport. That is what Highlands senior forward Leah Schaefer decided to do in the spring. The 6-foot-1-inch Schaefer verbally committed to play basketball at Xavier University just across the Ohio river in Cincinnati. She’d also been recruited by other NCAA Division I schools like Austin Peay University in Clarksville, Tenn. and the University of Massachusetts. Schaefer said the location had a lot to do with her decision. Her family and friends, especially from Summit Church of Christ in Coldspring, Ky., can come see her play. Schaefer had plenty of help in the recruiting process. That started with her head coach Jaime Walz-Richey. Richey is the state’s all-time leading career point scorer with 4,948 points for both men’s and women’s basketball. Richey waited until her senior year to make a decision to attend Western Kentucky. The Hilltoppers were a Top-10 team at the time. Richey scored 1,044 points in her career in Bowling Green and led the Toppers to three NCAA Tournament appearances. Western Kentucky and the University of Kentucky flew her down on private planes. Former Highlands standout Tara Boothe-Smith also attended Xavier and had a wonderful career there. Smith finished with a school-record 2,324 points and 1,004 rebounds. Smith committed during her junior year. Smith is currently the head coach at Dixie Heights. Schaefer is aware that some comparisons will most likely be made between herself and Smith. But Schaefer quickly dismissed the idea of it bothering her. Richey said Smith was taller and physically stronger than many of her opponents in high school so she could score almost at will. Richey said Schaefer is a good all-around player. Smith is not concerned about Schaefer trying to be like her. Schaefer’s recruiting started with Amateur Athletic Union basketball during the offseason. She played with the Cincinnati Angels this past year. Prior to that, Schaefer spent four years playing for Cincinnati’s Finest and two with the Cincinnati Legends. Highlands finished 17-16 last year. The Ladybirds finished 36th District Tournament Runner-up to Newport Central Catholic before falling 13-8 to Notre Dame in the Ninth Region Quarterfinals. Schaefer averaged 14.9 points and 8.55 rebounds per game. She shot just under 82 percent from the free-throw line and a little more than 47 percent from the field. Schaefer handled a lot of the ball handling when teammate and guard Ava Abner went down with an injury in late December. Xavier finished 8-20 overall and 5-9 in Atlantic-10 play last year in Waugh’s first season. Waugh played for the Musketeers and helped them to the NCAA Elite Eight as a player in 2001 and as an assistant coach in 2010. Waugh served as an assistant coach at Xavier before becoming head coach. In her six years as head coach and player, Xavier has five NCAA Tournament appearances. Waugh can not comment on Schaefer per NCAA rules until Schaefer signs with the Musketeers in the fall. But Smith played with Waugh for one season. Schaefer said she’s tried to improve her ball handling and three-point shooting in the offseason. Schaefer is one of several returning starters. Abner, Jesse Daley, Brianna Adler and Emilie Parton all started some last year. Schaefer likes to lead both verbally and by example. She said communication with the coaches and each other will be another key to the team’s success. Highlands opens the season on Nov. 27 at 7:30 p.m. at home against Dixie Heights. Photo Credit by Wayne Litmer: Schaefer goes up for a shot in the Ninth Region Quarterfinals last year. The Highlands Ladybirds soccer team ended a four-game winless string with a 3-1 victory over the host Boone County Lady Rebels (2-5) on Wednesday. Highlands moved to 2-3-1 overall. The Ladybirds had been outscored 9-0 in losses to state powers St. Henry, Notre Dame and Lexington Catholic before tieing Simon Kenton, 2-2 on Monday. Freshman forward Brooklynn Rivers continued her excellent season with two more goals in the win. She has five for the season. Teammate Allyson Bridewell had the other Ladybird goal. Jesse Daley and Sarah Owen once again split time at goalkeeper for Highlands. Owen made two saves and Daley made none. Highlands does not play again until Tuesday. The Ladybirds travel to Alexandria to face Bishop Brossart in a 5:45 p.m. contest. The Newport Central Catholic Lady Breds volleyball team traveld to Taylor Mill and beat the Scott Lady Eagles, 3-2 (25-22, 22-25, 17-25, 25-20, 15-11). NewCath (4-7 overall) saw Senior Libero Maria Froendhoff record 29 digs and setter Alyssa Maier make 35 assists. Nikki Kiernan and Abbie Lukens led the Lady Breds with 12 and 10 kills respectively. The win snapped a three-game losing streak for NewCath. On the other side, Andrea Sullivan's Lady Eagles fell to 3-9. NewCath plays again today at 7:30 p.m. against Campbell County. It came down to a shootout in the 9th/10th Region All Ä Soccer Tournament on Wednesday. Newport Central Catholic and Bishop Brossart battled to a scoreless tie after regulation. But the Lady Mustangs (4-3 overall) edged the Lady Breds, 4-3 in the shootout to take the game 1-0. Erin Ackerson had six saves at goalkeeper for the Lady Breds. The Lad Breds (4-1) take on visiting Villa Madonna at 5:30 p.m. today. A common trait of the Newport Central Catholic Thoroughbreds is their ability to pick themselves up after a loss. The proud football team finds itself in this situation when it heads to Alexandria on Friday for another non-district clash with the Campbell County Camels of Class 6A, District 6. Both teams are 1-1 overall. The Thoroughbreds have not lost consecutive games since Eddie Eviston took over as head coach in 2010. NewCath is 25-5 during that time and 137-35 since the start of 2000. The Thoroughbreds came into 2012 tied for fifth in Kentucky with Louisville St. Xavier with 136 wins since 2000. The last time they did lose consecutive games was Sept. 18 and 26, 2009 when Campbell County and Covington Catholic handed them 21-17 and 28-14 defeats respectively. Campbell County has been on NewCath’s schedule since 2007 and that was the Camels’ lone win in five games in the series. The Thoroughbreds will face a team on the rise. The Camels finished 4-8 last year, starting off 0-5, but bounced back to go 3-1 in Class 6A, District 6 action to win their first district championship in 31 years. They lost at home to Lexington Lafayette, 20-7 in the second round of the playoffs. Dual-threat quarterback Tyler Durham is a big reason for that turnaround. Durham ran for 217 yards and three touchdowns and threw for 140 yards and one touchdown in Campbell County’s 34-14 win at Milford (Ohio) on Friday. The Highlands Bluebirds recorded a huge 1-0 victory over the Boone County Rebels on Tuesday at Tower Park. The Rebels came into the game undefeated at 4-0. Highlands improved to 4-2 with the victory after going 1-2 in the Kentucky Cup at Louisville Ballard. Bluebird senior Emerson Holladay scored the game's lone goal. Sophomore Nick Breslin recorded eight saves at goalkeeper for Highlands. The Bluebirds take on Dixie Heights (2-4) at 8 p.m. Thursday. The host Newport Central Catholic Lady Breds soccer team stayed undefeated at 4-0 with a convincing 9-0 win over Calvary Christian (1-1-2) on Tuesday to open the All Class A Ninth/10th Region Classic. The Lady Breds saw Sam Bunzel lead the way with three goals and Chandler Cain score two. Teammates Michela Ware, Loren Zimmerman, Christina Seibert, and Emily Weyer all added goals. Bunzel, Seibert, Madison Little, Nikki Buller and Courtney Hagedorn all had assists. Sophomore goalkeeper Erin Ackerson did not have to make any saves because Calvary got off no shots. The Lady Breds take on Bishop Brossart (3-3) to continue the tournament. Game time is 6 p.m. The Thoroughbreds soccer team continues to struggle in a 4-0 loss at Ryle on Tuesday. NewCath fell to 1-4 while the Raiders improved to 3-2 with their third straight win. Thoroughbred goalkeeper Ben Tiereny had eight saves. NewCath travels to Montgomery County next Tuesday for a 6 p.m. contest. Football teams have their own ways of handling bye weeks. For the top-ranked team in Class 4A, it may not be as intense as game weeks. But the deeply talented Highlands Bluebirds still plan to find ways to become even scarier. Mueller said the Bluebirds will also lift weights three times this week and look to get healthier. Highlands saw several players not dress for various reasons in the Scott County win. The Bluebirds come into the week 2-0 overall with impressive wins over two talented 1-1 teams in Boyle County and Scott County. Yet Highlands beat both teams by an average of 56-34. Most of Scott County’s points came in the second half. The Rebels beat Collins, 49-26 on Saturday. They are 53-6 since Larry French took over as head coach in 2008 including spotless 15-0 runs to the Class 4A state championships in 2009 and 2010. The Cardinals are 45-13 since the start of the 2008 season. Veteran head coach Jim McKee’s teams have been to at least the Class 6A regional finals the last four years. They were state runner-up last year falling 62-21 to Louisville Trinity in the title game. Many did not believe the Bluebirds would put up offensive numbers similar to last year’s team with the graduation of quarterback Patrick Towles, last year’s Kentucky Mr. Football who is now playing down Interstate-75 at the University of Kentucky, among others. But the Bluebirds are on pace to put up similar numbers through two games. The 2011 team broke state records with 849 points, 121 touchdowns and 7,517 total offensive yards. Highlands averaged 56.6 points, just more than eight touchdowns and a little more than 501 yards per game. Through two games, Highlands has 16 touchdowns, 112 points and 1,077 yards of total offense. That averages 8 touchdowns, 56 points and 538.5 yards per contest. The Bluebirds have done most of their damage on the ground rushing for 795 yards with 15 touchdowns. None of them players go both ways so Highlands rotates in many players, especially on the offensive line that has some players weighing above 240 pounds. Quarterback Donovan McCoy and running backs Jaylen Hayes and Zach Harris have 14 of the 16 Highlands touchdowns. The other two touchdowns came when McCoy connected on a 33-yard strike to Luke Turner and a Colin Seidl 43-yard score, both against Scott County. Harris leads the team with 235 yards rushing on 38 carries with four touchdowns for an average of 6.2 yards per carry. Hayes is second with 211 yards on 17 carries with four touchdowns for an average of 12.4 per touch. McCoy has 197 yards rushing on 20 carries with six touchdowns for an average of 9.85 a touch. Highlands’ defense has helped set up six of those touchdowns. The Bluebirds have a plus-4 turnover ratio (6-to-2) and have scored 39 points off those turnovers. Scott County and Boyle County did not score any points off the Bluebird miscues. The Bluebirds currently carry a 22-game winning streak. They are 75-2 since the start of 2007 and own a 41-game home winning streak. Highlands needs to defeat the host Louisville Western Warriors on Sept. 7 and the Mason County Royals on Sept. 14 at David Cecil Memorial Stadium before worrying about a potential showdown with the arch-rival Covington Catholic Colonels. On paper, neither game looks like much of a challenge. Western is 0-1 losing 20-6 at home to Louisville Ballard on Aug. 17. Highlands handled the Warriors, 56-0 last year in Fort Thomas. The Royals are 0-2 to start this year. They lost 55-6 at Lexington Lafayette on Aug. 17 and 21-14 to Montgomery County on Aug. 24. Mason County finished 2-8 last year. The Royals have had success recently. They finished 10-2 losing to eastern Kentucky power Belfry, 27-14 in the second round of the Class 3A playoffs in 2010. They had an undefeated regular season in 2009 finishing 11-1 before losing 26-23 to Pike County Central in the second round of the 3A playoffs. The Colonels have rolled through their first two opponents by scores of 37-0 and 54-0 over Campbell County and Dixie Heights. Standout quarterback Blake Bir completed 22-of-35 passes for 295 yards and three touchdowns against Campbell County. He then completed 17-of-25 passes for 317 yards and six touchdowns against Dixie Heights. Covington Catholic still has to take down Cincinnati LaSalle, Boone County and Beechwood before facing the Bluebirds. The schedule could favor the Bluebirds. 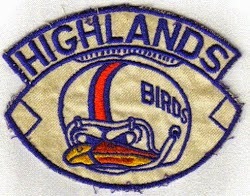 Highlands entered the season ranked second in the country behind the Valdosta Wildcats of south Georgia for the most wins all-time. Highlands could catch Valdosta in a matter of years if certain trends keep up. The Wildcats entered the year with an overall record of 869-205 with 34 ties. They open their season Friday in what is their 99th season of football. They started their program in 1913 but the 1918 season was cancelled because of World War I and a flu epidemic. On the other hand, Highlands moved to 830-224-26 with the win over Scott County on Friday against 131 different opponents. The Bluebirds started their program in 1915 and did not miss the 1918 campaign going 4-5-1 that year. The 2014 season will mark the 100th in school history. The Bluebirds have just eight losing seasons in school history and none since 1955 when they went 4-5-1 for a total of 56 consecutive winning seasons. Highlands has won 21 state championships tied with Louisville Trinity for the most in Kentucky and own nine state titles since 1998. Meanwhile, Valdosta did go 1-9 in 2006 for its first losing season since 1974. The Wildcats own 23 state championships, six mythical national championships and have just five losing seasons in school history. However, Valdosta has not won any state championships since 1998 mostly because it plays in a tough region. Teams in their Region 1-AAAAA (largest of Georgia’s five classes) have won seven state championships since then including three by cross-town rival Lowndes County. The success of Lowndes County, Valdosta High and NCAA Division II Valdosta State University in football helped the town become Title Town, USA by ESPN in 2008. The Bluebirds have also had the same head coach in Mueller during that time while Valdosta is on its fourth in third-year head coach Rance Gillespie. The Wildcats went 8-3 last year losing in the first round of the AAAAA playoffs. Valdosta and Highlands are two of just five teams nationally with more than 800 wins in school history. The other three entering the season are Louisville Male (currently with 817 program wins), Massillon Washington (811) located near Akron, Ohio, and Mount Carmel, Pennsylvania (801) located 88 miles northwest of Philadelphia. The Highlands Ladybirds soccer team dented the scoreboard for the first time since the season-opener Monday. But neither team left Tower Park with the thrill of victory. Highlands and Simon Kenton tied 2-2. Brooklynn Rivers scored both goals for the Ladybirds. The freshman has all three goals for Highlands this season. Highlands is 1-3-1 and the Lady Pioneers are 3-1-1. The Ladybirds broke a three-game losing skid where the lost by a combined 11-0 last week to state powers St. Henry, Lexington Catholic and defending state champion Notre Dame. Highlands travels to Boone County (2-4) for a 7:30 p.m. contest Wednesday. Highlands lost to Kings (Ohio) on Monday in Parent Appreciation Night, 3-0 (25-17, 25-15, 25-14). The Ladybirds fell to 3-5. They have lost 5-of-6 matches since opening the season with two wins. Highlands travels to Bishop Brossart on Thursday for a 7:30 p.m. contest. The Newport Central Catholic volleyball team traveled to Cincinnati Roger Bacon and lost two games on Monday. The Lady Breds lost to Roger Bacon, 21-25, 21-25 and 13-25, 14-25 to Cincinnati Mercy. NewCath is 3-7 overall. NewCath travels to Scott on Wednesday for a 7:30 p.m. contest. CINCINNATI – Many point to one play as the difference-maker in a tight win or loss. But it’s actually a number of plays that can change the outcome of a football game. The Newport Central Catholic Thoroughbreds found that out in a tough 27-24 loss at the Cincinnati McNicholas Rockets on Saturday. Rocket senior quarterback Austin Ernst completed the game-winning touchdown pass with 47 seconds left. McNicholas runs a lot of read-option plays out of its spread formation. Ernst fakes a few handoffs to the running backs, rolled right and found receiver Matt Curan for a 6-yard score and standout kicker Pat DiSalvio added the extra-point. The Thoroughbreds (1-1) could not make anything happen out of their final possession as the Rockets escapted with a win in their season-opener. NewCath won last year’s meeting 23-13 en route to an 11-2 mark while the Rockets finished 2-8 after driving to the Ohio High School Athletic Association Division III state semifinals in 2010. This marked just the fifth loss for the Thoroughbreds since Eddie Eviston took over as head coach in 2010. The Rockets showed a lot of balance out of their attack. Ernst carried the ball 13 times for 78 yards and completed 13-of-24 passes for 187 yards to seven different receivers. Dylan Hayes had another big game at running back for the Thoroughbreds. He ran the ball 16 times for 95 yards with two more touchdowns bringing his overall total to six touchdowns for the year. NewCath quarterback Josh Cain completed 14-of-21 passes for 156 yards. Pete Collopy and Dan Ruwe had five receptions each for 54 and 41 yards respectively. Both teams had one turnover each. Mac Franzen picked off a tipped pass from in the end zone for NewCath and ran the ball out to the Thoroughbred 3 to thwart a Rocket scoring chance at the end of the first half. But McNicholas scored seven crucial points off NewCath’s lone turnover. Kevin McHale picked up a Thoroughbred fumble and ran it in from five yards out to put the Rockets up 7-0. DiSalvio added a field goal a few minutes later to make it 10-0 McNicholas. NewCath tied the game at 10 in the second quarter. Cain found Collopy from 23 yards out with 10:38 left and John Caudill hit a 15-yard field goal with 6:49 left. The Rockets came out and took the lead to start the third. Ernst scored on a 9-yard scamper. But NewCath tied the game with 18 seconds left in the third. Hayes scored from 20 yards out on a draw play. Cain converted a 3rd-and-19 on a quarterback draw during the drive. McNicholas came out in the fourth and took the lead at 20-17 when DiSalvio hit a 19-yard field goal. But the Thoroughbreds responded with a 10-play, 80-yard scoring drive. Hayes scored from five yards out to put NewCath up 24-20 with 3:23 remaining in the game. The Rockets covered 63 yards in six plays on the game-winning drive. The first four plays covered at least 11 yards. Overall, McNicholas had 18 first downs and converted 4-of-10 on third down. NewCath had 15 first downs and converted on 3-of-10 opportunities. NewCath travels to Campbell County (1-1) on Friday for a 7 p.m. contest. The Highlands Bluebirds soccer team fell 4-3 to the Louisville St. Francis Wyverns on Saturday in the final game of the Kentucky Cup at Louisville Ballard. Highlands fell to 3-2 overall and St. Francis improved to 2-1. Chris Garbig, Devin Dupont and Michael Cirulli scored goals for the Bluebirds. Colin Dean and Emerson Holladay had assists for Highlands. Reed Smith, Napo Matsoso, Mohammed Musa and Seth Moshoeshoe all had goals for the Wyverns. Matsoso and Moshoeshoe had assists. The Bluebirds take on Boone County tomorrow at 8 p.m.
Highlands played better Saturday against the undefeated, defending state champion Notre Dame Pandas. But the Ladybirds soccer team still could not score in a 2-0 loss in Park Hills on Saturday. Highlands fell to 1-3 in the tough week losing by a combined 11-0 to St. Henry, Lexington Catholic and Notre Dame (6-0). Highlands takes on Simon Kenton at 8 p.m. tonight. The Newport Central Catholic Lady Breds soccer team moved to 3-0 with a 2-1 win at Lexington Dunbar on Saturday. Lauren Zimmerman had two goals for Newport Central Catholic. Chandler Cain and Nikki Buller had one assist each. The Lady Breds knocked off Simon Kenton on Wednesday, 4-0. Zimmerman, Mikayla Seibert, Cain and Courtney Hagedorn scored goals for NewCath and Erin Ackerson had three saves at goalkeeper for her first career shutout. NewCath takes on Calvary Christian to start the All “A” Region 9/10 Classic tonight at 6 p.m. The Highlands Bluebirds defense faced another tricky offense this game. The Scott County Cardinals brought a traditional Wing-T offense to the table after the Boyle County Rebels used a Wishbone look in the season-opener. Two running backs lined up side-by-side behind quarterback Clay Mckee in the backfield and had another back line up in the slot. Like Boyle County, Scott County motioned one of its backs and the second back often came through with the ball. Highlands (2-0) struggled in the first half of the win over Boyle County with that Wishbone style. But the Bluebirds contained the Cardinals' potent attack holding them to 256 yards on 37 carries for an average of just 6.9 per carry in a 60-37 win. Scott County (1-1) ran for 360 yards in its season-opening win over Louisville Seneca. But the Cardinals had to throw when the Bluebirds went up big in the second quarter. McKee completed 5-of-11 passes for 158 yards. But Blake Schutte and Ben Streeter picked off one pass each and Schutte recovered a Cardinal fumble. McKee broke in at quarterback for the graduated Jay Lawler. Lawler took his talents to Eastern Kentucky University. The Bluebirds scored 20 points off those turnovers after scoring 19 off Boyle County turnovers last week. Highlands is at plus-4 in the turnover department. Opponents have not scored any points off Highlands' two turnovers. "The guys exectued so well," said Dale Mueller, Highlands head coach. "If you can get up on a team and make them throw, you've really helped yourself. Some of those (interceptions) were zone coverage things where they made their reads and were in good position to make a play." Scott County did play standout running back Dieries Dumphord. He gained 122 yards on 13 carries for an average of 9.3 a run. He broke free for a 50-yard run in the second quarter. But he fumbled it at the end and Schutte recovered it. Dumphord ran for 1,148 yards and 19 touchdowns last year. Dumphord sprained an ankle in a preseason scrimmage and did not play against Seneca. Kevo Edwards and Kevin Clausen rushed for 148 and 110 respectively against Seneca. Edwards ran for just 32 in the loss Friday. Edwards did burn the Bluebirds for a touchdown in the first quarter. McKee faked a few handoffs before rolling left to find Edwards wide-open for an 80-yard touchdown with 3:59 left in the stanza. But no Cardinal receivers found themselves that wide-open again. "We had a couple slip-ups," said Jake Heck, Highlands senior defensive back. "But overall, we did a good job. We just had to focus on what we were doing. The corners stayed back and watched everything in front of them." Mueller said the Bluebirds plan to get better during the bye week. That is even scarier for opponents for a team that has 112 points and 16 touchdowns in two games so far against two formidable opponents. Scott County finished 14-1 last year losing 62-21 to Louisville Trinity in the Class 6A title game. Boyle County came into the Aug. 17 with a superb 52-5 record since the start of 2008 when Larry French took over as head coach. One area of improvement is converting extra-points. The Bluebirds converted just 5-of-8 against the Cardinals. It did not matter in that game, but could be crucial in close contests. Evan Allen and Luke Brockett are the listed kickers on the Highlands roster. "We try to be as perfect as we can," Allen said. "They are going to be mistakes sometimes. They (Cardinals) were rushing hard up the middle. The snap and kick were good. We just have work on the blocking." The Bluebirds did see several players not suited up Friday. The most noticable is senior wide receiver Jac Collinsworth. After the win over Scott County, Collinsworth said he's recovering from a hamstring injury but he'll be back for the game against Eastern. Highlands travels to Louisville Western at 7:30 p.m. on Sept. 7. The Highlands Ladybirds soccer team had another tough defeat Thursday to a state power. 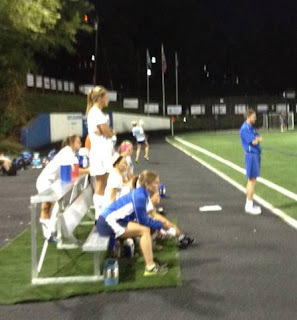 The Lexington Catholic Lady Knights came to town and shut out Highlands, 4-0. This follows a 5-0 loss to St. Henry on Monday. The Ladybirds dropped to 1-2 overall and LexCath improved to 2-1-2. "We want to play the best teams in the state because come postseason, you have to beat the best teams in the state," said Tommy Kearns, Highlands head coach. "That way, October doesn't feel like a surprise. Lexington Catholic is a fine team. We have to continue to work hard to try to get to that level." The Ladybirds once again saw an opponent score a hat trick. On Monday, reigning Kentucky Player of the Year Libby Leedom did it scoring three goals with an assist. The Lady Knights' Mary Beth Gorham did it Thursday with three goals. Gorham put Lexington Catholic up for good with 3:07 left in the first half. She made a few moves and kicked one to the back of the net to put the Lady Knights up 1-0 at halftime after just missing moments earlier. Gorham scored her second two goals within 3:18 of each other. The first came on a penalty kick. "(Gorham) is really quick and skillful with the ball," Kearns said. "She hits as good of a shot with her right foot as anyone around here. Anytime you have that many strong players, it's tough to mark that many of them. Their speed caused us problems." The Lady Knights added one more goal with 8:49 left in the game. It came off the foot of Tyler Patton. The Lady Knights outshot the Ladybirds, 12-1. Jesse Daley and Sara Owen once again split time at goalkeeper for Highlands. Daley made six saves before Owen took over about midway through the second half. Owen made two saves. Highlands had some shots go far and wide. Lady Knight goalkeeper Sarah Youkilis saved the Ladybirds' lone shot in the second half. Highlands faces another tough challenge on Saturday at 7 p.m. The Ladybirds travel to Park Hills to take on the undefeated defending state champion Notre Dame Pandas (5-0). The Highlands Bluebirds soccer team bounced back to knock off host Louisville Ballard, 4-3 on Thursday in the Kentucky Cup. Highlands (3-1) led 3-0 at one point. Mitch Gesenhues, Emerson Holladay, Alex Schmits and Petr Carter scored goals for the Bluebirds. Sophomore goalkeeper Nick Breslin made five saves in net for the Bluebirds. Highlands concludes the Kentucky Cup on Saturday. The Ladybirds took down District 36 rival Dayton, 25-10, 25-8 on Thursday. Highlands improved to 3-4 overall snapping a four-game losing streak and 2-0 in district action. Brooke Hamilton led the Ladybirds with six aces and four digs. Highlands comes home to face Kings (Ohio) at 7 p.m. Monday. The Newport Central Catholic soccer team took Bishop Brossart to a shootout, but fell in the shootout 5-4 to lose the game, 2-1. The Thoroughbreds fell to 1-3 with the loss. Nathan Grosser scored the goal for NewCath and goalkeeper Ben Tiereny had nine saves. NewCath continues action Tuesday at Ryle at 8 p.m. The Newport Central Catholic Lady Breds volleyball team (3-5) fell in three 25-16, 25-16, 25-20 to power Newport Central Catholic on Thursday. The Lady Breds take on Roger Bacon and Mother of Mercy on Monday. The first game starts at 5 p.m. The Highlands Bluebirds men’s soccer team dropped its first game of the year Tuesday in the Kentucky Cup at Louisville Ballard. The Louisville Collegiate Titans (1-0-1) of the 7th Region nipped the Bluebirds, 1-0. Highlands is 2-1 overall with the loss. They play again in the Kentucky Cup at 5:30 p.m. Thursday. The Bluebirds fell to 2-4 with a two-game loss at Ninth Region contender St. Henry on Tuesday. The Crudsaders (7-2 overall) won 25-10, 25-15. Sophomore outside hitter Jessica Ginter had seven digs and three kills for the Bluebirds and senior outside hitter Sydney Lindeman added three kills. The other leaders for Highlands were sophomore setter Kaitlin Hall with two aces and nine assists, and senior libero Katie Van Curen with seven digs. Highlands takes on visting Dayton at 7:30 p.m. Thursday. The Lady Breds fell to 2-4 with a three-game loss to the Covington Holy Cross Indians on Tuesday. Holy Cross won 25-15, 25-21, 25-20. Holy Cross improved to 3-2. NewCath travels to Dayton for a District 36 contest tonight at 7:30 p.m. The Newport Central Catholic Thoroughbreds football team tends to rise up for challenges. They have another one this Saturday when they cross the Ohio River into east Cincinnati to face the McNicholas Rockets. McNicholas is an Ohio High School Athletic Association Division III school – the third-largest of Ohio’s six classes – and a member of the rugged Greater Catholic League Central Division. The Rockets struggled to a 2-8 mark under first-year head coach Mike Orlando last year after going 11-3, winning the GCL Central title and driving all the way to the state semifinals in 2010. That included a 23-13 defeat to the Thoroughbreds last year at the University of Cincinnati’s Nippert Stadium. This marks the first contest for the Rockets, while NewCath comes in off a 37-22 win over Dixie Heights in the Skyline Chili Crosstown Showdown. The Thoroughbreds hope to bring the same intensity to this game they did against Dixie. They did not turn the ball over and outgained the Colonels, 349-287 in total offense including 227 yards on the ground on 42 carries. Senior Dylan Hayes led the way with 138 yards on 23 carries with three rushing touchdowns and a kickoff return for a score. NewCath had some balance offensively out of its spread attack against Dixie. Quarterback Josh Cain completed 16-of-24 passes for 122 yards including seven to Mac Franzen for 58 yards. Cain has plenty of experience around him until he settles in to the new full-time role. The Thoroughbreds will also face a spread offense Saturday. Senior quarterback Austin Ernst returns for the Rockets after throwing for 926 yards in 2011 and senior running back Kevin McHale comes back after rushing for 647 yards last year. Ernst can throw to wide receivers Michael Mink and Thomas Vogele. Franzen and Hayes did pick off Dixie quarterback Drew Moore once each. Franzen’s interception led to a Hayes touchdown. Moore completed 16-of-23 passes for 167 yards and had 92 yards rushing on 15 carries. He scrambled 78 yards for a touchdown just 2:10 into the game. The Colonels did have some success when Moore scrambled outside the pocket and on crossing routes. NewCath will face a 4-3 defense. Paul Wilson, Logan Stultz and Kevin Williams anchor the defensive line. Williams had 2.5 sacks last year. McHale leads the Rocket linebackers and junior Daniel Sandmann leads the defensive backs. McNicholas does return a good kicker in senior Pat DiSalvio. He made 11-of-17 field-goal attempts and 68-of-72 extra-point tries last year. DiSalvio also averaged 37.3 yards per punt. Game time is 1 p.m. at Penn Station Stadium. The final score did not look good for the hosts. But there were just two things that separated the women’s soccer teams in the St. Henry Crusaders’ 5-0 win over the Highlands Bluebirds on Monday at Tower Park. That is Libby Leedom and the abilities to finish shots. Leedom, the 5-foot-8-inch senior midfielder/forward, turned in a hat trick with three goals and an assist in the win. Leedom, a University of Dayton commit, scored 23 goals and had 13 assists last year and helped the Crusaders to the 2010 state championship. Highlands tried many things against Leedom out of its 4-4-2 (defender-midfielder-forward) attack. St. Henry outshot Highlands, 10-5 and converted 50 percent of the shots. Crusader goalkeeper Morgan Potts turned back all five Bluebird shots. In the other goal, Sara Owen played the first half for Highlands (1-1 overall) and made two saves. Senior Jesse Daley took over in the second half and made three saves. St. Henry improved to 2-1 with the win. Crusader head coach Steve Lorenz told his girls this marked the first time he’d ever won at Tower Park as a head coach. Prior to coming to St. Henry, Lorenz spent four seasons as the head coach at Boone County. Leedom scored her first two goals with 29:19 and 5:46 left in the first half. Teammate Jenna Litzler scored her first of two goals with less than two remaining in the half. Leedom made the hat trick with 27:17 left in the game and Litzler scored her second with 21:05 left in the half. Highlands had plenty of chances to avert the shutout in the game’s final 20 minutes. Allyson Bridewell hit one off the top of the crossbar with 19:06 remaining. Brooklynn Rivers had a big shot deflected wide by Potts with 14:40 left in the game and had another one go off the crossbar with 3:26 left in the game. St. Henry had nine free kicks to three for Highlands. Only one yellow card came in the game. It was against Highlands. Highlands then continues its tough week back at Tower Park against Lexington Catholic at 7:30 p.m. on Thursday. The Lady Knights are 1-1-2 with a 4-2 loss to Notre Dame on Saturday.